Someone once told me that every voice you’ve heard, every path you’ve walked and every meal you’ve eaten gets absorbed into your very “cells” and becomes part of who you are. But most of the time, people are so busy living their lives that they aren’t consciously aware of these lingering experiences. Until, like Proust, you bite into that madeleine and suddenly your childhood comes flooding back to you; or you hear an old song and suddenly you’re sixteen years old and madly in love for the first time. So when Pablo Picasso gravitated toward special places where a vast variety of artists chose to congregate—like Paris and the French Riviera—he could hear Stravinsky’s compositions while Stravinsky could in turn be influenced by Picasso’s paintings, and Isadora Duncan could dance amid this backdrop of creative fervor, and F. Scott Fitzgerald could transmute it into his novels. Meanwhile they all ate and drank the local food and wine, and walked barefoot on the sandy shores of the salty Mediterranean Sea, watching and listening to the fishermen who called out to each other when hauling in their great big fishing nets. From the moment I set foot on the French Riviera as a writer-in-residence at an artists’ colony, I became immersed in that heady mix of art, history and ordinary life which I found utterly seductive. I absorbed all the voices, past and present: the singsong sound of the marketplace vendors as they sold fresh fish, flowers, cheese, fruit and vegetables; the musical cacophony of diners at lunchtime on a café terrace; the shouts in the kitchens of busy restaurants; the splash of the sea, the call of the gulls. I listened to recordings of Pablo Picasso so that I could pick up the particular Spanish way that he pronounced his French. And I wrote it down as fast as I could, while all those voices echoed in my head. Months and months later, when I heard that Penguin Random House was not only going to publish my novel COOKING FOR PICASSO but also planned to record an audiobook, I was thrilled. But, I wondered, how would one narrator manage to recreate the subtle differences of, say, the voice of my main character, Ondine, who progresses from being a wide-eyed seventeen year old French girl in 1936, to becoming the elderly matriarch of her family decades later? How to differentiate Ondine from her French parents who run the café where Picasso comes to eat? And how would my narrator portray the modern-day characters in the book, starting with Céline, who is Ondine’s American grand-daughter who grew up in New York; and Matilda, Céline’s Irish aunt; and Gil, the temperamental British chef who teaches them both how to cook at his hotel, where all the other guests are from various far-flung corners of the world, each with their own special accent and cadence? And how could a female narrator do all the male voices in the novel—from Luc, the love of Ondine’s life, to Monsieur Clément, the mysterious French lawyer—to the great Picasso himself? I was delighted when I heard the first segments of the taping. Mozhan Marno had studied and lived in Europe and America, and so she possessed all these voices in her very “cells”. She understood the delicate art of “intimating” without imitating. And I was astounded at how well just a slight drop of her voice could inflect the words with, say, Picasso’s amused modern sense of irony blended with his traditional macho authoritarian attitude. Also, Marno knew how to contrast what the characters were thinking to themselves versus what they actually said aloud to each other. So now, when my husband and I go off on long drives, he often pops the audiobook of COOKING FOR PICASSO into the CD player. And what I hear isn’t simply my own words. Books, like children, really do take on a life of their own when they go out into the world. Now what I hear are the voices of the characters singing their own special take on the people who came before us, the ones we live with now, and the ones who will come after us. And I hear the sounds of all the places where I’ve been…and all the places I have yet to go. 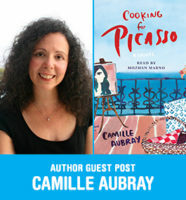 Visit Camille Aubray at her website: www.camilleaubray.com. COOKING FOR PICASSO is out now—also available in hardcover and e-book from Ballantine Books, and in Large Print. Sign up for our newsletters to be the first to hear more exclusive audiobook content from our authors and narrators! Wish you could press pause on summer? 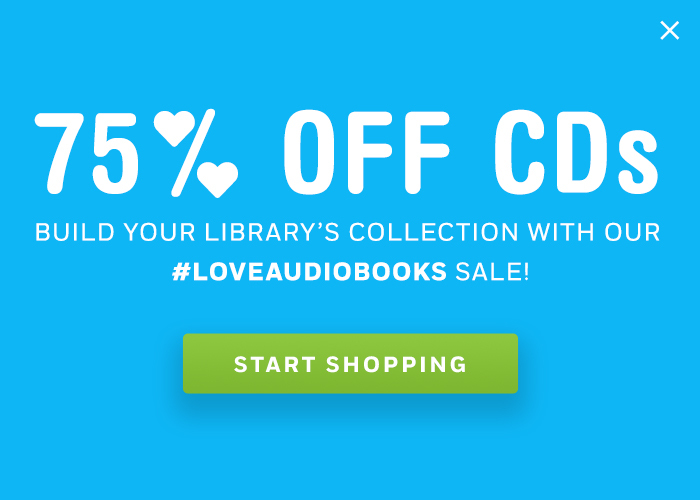 Tackle summer TBR lists with audiobooks!